PIP stands for Property Improvement Plan. We have developed the PIP for our clients in preparation for MEES regulations 2018. The EPC although a very useful report does not always detail the most cost effective route to reaching the minimum E banding required for rental properties from 2018. We create the PIP plan by visiting a property and creating a draft EPC report, we then use the data to re-model the EPC and work out not only the most cost effective route but also the least disruptive route to increase the properties rating to an E banding. Building Regulations in England are made under the Building Act 1984 and are regularly changed and updated to improve things like fuel and power conservation. This means if a property surveyed in 2008 was re-assessed in 2018 and no or little changes have been made it will most likely have a lower graded EPC due to tougher building regulations and the increase in fuel prices. It is our recommendation that not only F & G rated properties require attention we suggest your low rated E-band properties should be looked at to assess there current rating in preparation for the MEES 2018 regulations. Includes PIP report with EPC data alongside detailed information on property for landlord to use as step by step guide to improving property to minimum E band. 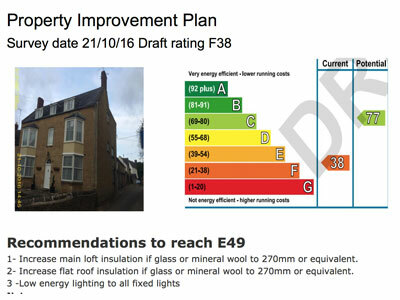 The PIP plan includes predicted rating once recommended works completed. 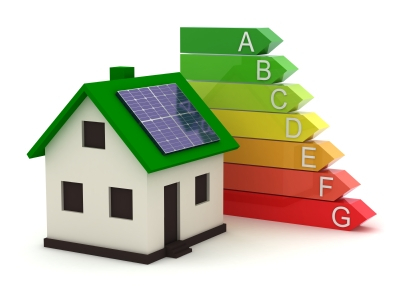 Re-visit to the site to complete EPC Energy Performance Certificate once improvements have made includes liaising with the property manager, landlord and or contractors with regards to work conducted.